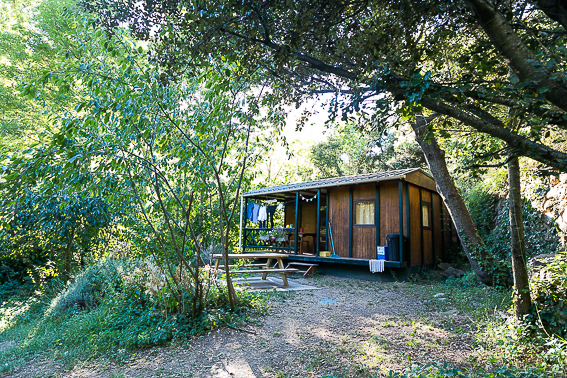 We have two small scale fully equipped one room houses, suitable for 2 adults. Own shower and toilet, small kitchen, own terrace. Pigsty 1 can be equipped with extra mattresses for 2 small children. The pigsty is also equipped with a gas stove that provides a cosy warm place for the off-season colder days. The châlet has its own beautiful private spot on the other side of the river. Suitable for a family with 3 or 4 children. It has 2 bedrooms, shower and separate toilet, kitchen and dining table. A large sliding door gives access to a large covered porch, with a dining table. It has direct access to the river. 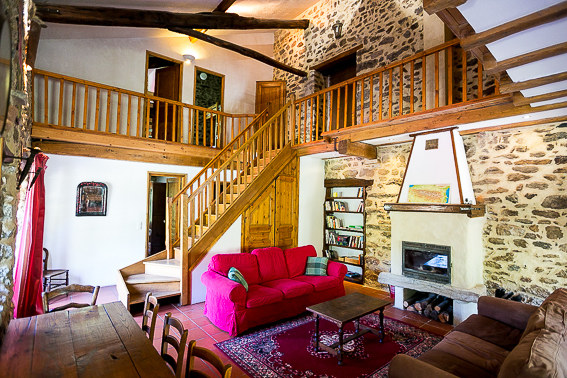 Our River Gîte is a small cosy apartment in our Mas, perfect for a family with 3 children. It has its own entrance, which is reached up one flight of stairs to the first floor. On this floor you will find a small, south-facing balcony, which has room enough for a table and chairs. On this floor you will also find a cosy living room with wood-burning stove, French balcony and an open-plan kitchen. On the east side of the the Gîte you will enjoy views of the river and on the south-side, there are views overlooking the communal area, with fire place where the evening meal is served. On the upper floor there are 2 bedrooms, a small bathroom with a toilet and a corner bath where you can also shower. Still in finishing stage, summer season 2019 new for rent ! Along a centuries-old footpath that in the past connected the mountains farms and villages, lies our Bergerie, nestled in the wooded foothills of Roc Savador. To reach it from our Mas requires a 10-minute walk up the mountain and is only suitable for people who are in good condition, since it is only accessible on foot. 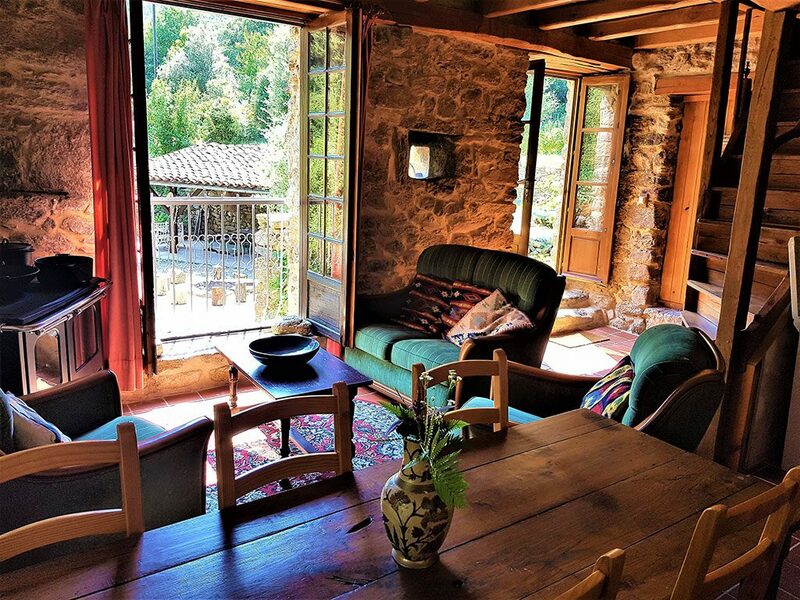 The Bergerie is perfect for people who wish to combine the conviviality of Mas de la Fargassa with the tranquility of the quiet forest that surrounds it. 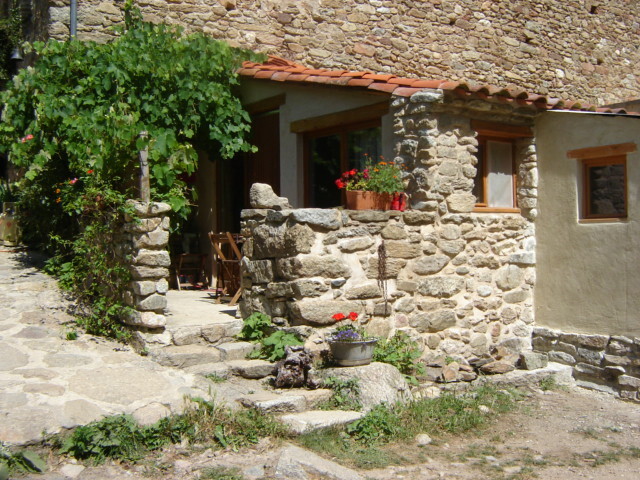 The Bergerie is a spacious, fully furnished, accommodation of 11 x 6 meters with a wonderful new, translucent roof. It has a simple kitchen with a simple water and electricity supply. It has an external compost toilet. It sleeps a maximum of 8 people. From the sunny terrace, directly above the house, you can enjoy beautiful views of the Pyrenees. ….You can hear the bell from Mas de la Fargassa, telling you it´s time for dinner…. This is a beautiful spacious accommodation inside the Mas. It has 4 bedrooms, a bathroom with shower and separate bath, an open-plan kitchen and a wood-burning stove. It also has a large and a smaller balcony and its own entrance. Suitable for 8 to 10 people.